This month's edition of Regional Recipes brings us to the United States of America. Throughout its history, America has been a land of opportunity, a magnet for immigrants all over the world, to start anew and make good. Is it also a land of culinary opportunity for this month's Regional Recipe participants? Let's start anew and make something delicious. I'm not sure if we are to get away from the America-hamburger association. But, this is a delicious burger indeed. A whopping half-pound patty? Feta cheese? Bring it on! 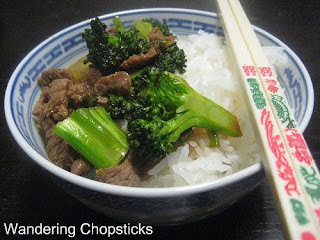 You'll see Beef and Broccoli on most every Chinese restaurant menu in America, but surprise, surprise, the dish isn't actually Chinese! It's a American invention, and quite often, served on a bed of steaming rice, it hits the spot (certainly li'l sis' hunger spot) after a hard day at work (or school). In her part of the world, Ning says they easily associate apples with America. Apples are certainly invoked in America's mythos: we've all heard of the phrase "as American as apple pie." 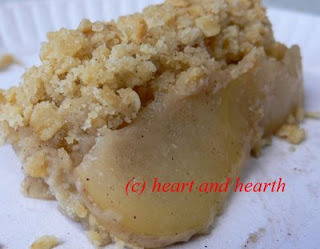 Ning does not have a pie here, but an easy peasy apple crumble that's just as delicious. This continent's native bird is the turkey and Joanne creates the most American application for it, a burger loaded with the flavours of American barbecue. Yummy! Of course, it has to be served with some fries, Texas home fries. A Southern classic. Susan's version has buttery biscuits with a now-famous sausage gravy. 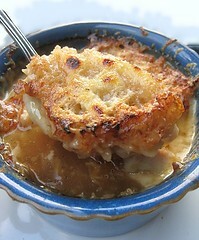 ;) This is a dish we have yet to try (making or eating), but we will have to now. This must be the best name of a dish in this edition. 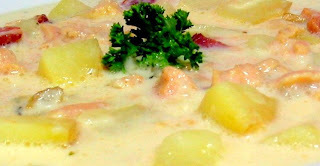 =) It is exactly as the name says: this is a clam chowder recipe for people who don't have ready access to seafood, using canned clams. It's ready in no time at all. Christine has fond memories of BLT sandwiches, feeling sophisticated and decidedly American as a teenager munching on these sandwiches. 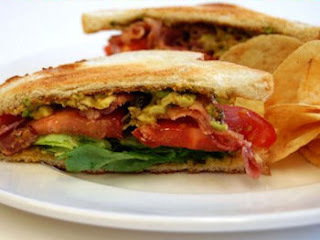 Nowadays, she adds a bit of California glamour to the usual BLT by adding creamy avocadoes. Another burger! But, this one is made with "America's original red meat": bison. Bison is leaner and healthier than beef, and in most cases, more humanely raised than the standard feedlot cattle. Is it just as delicious? You bet it is. Bring this one on too! We first did a Canadian version of onion soup, using turkey stock and Oka cheese, figuring to pair it with America's great sandwiches (or burgers). However, serendipitously spying a recipe for muffuletta left on a messy table led to a craving of said sandwich -- and what we thought to be a more appropriate entry! 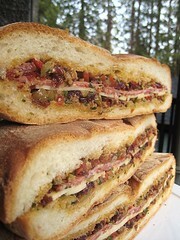 The muffuletta is a genuinely American creation, invented by a Sicilian immigrant in New Orleans. It seems like we did not stray much from the conception that American food is all about burgers, hotdogs, and sandwiches. Are these really what most Americans eat on most days? And hey -- sandwiches? Burgers? Is that really what Americans eat? How about muffins? Cupcakes? Mac n cheese? Casseroles of any sort? What are other American foods? We can't wait to see the entries for this one! Regional Recipes, a blogging event created by Blazing Hot Wok that celebrates food from all over the world. Great round-up! I guess people do associate burgers with America, but at least we got lots of different delicious versions! Great round-up. I am really craving some bisquits and gravy right now! Great round-up ladies. Thanks so much for organizing. I guess we just can't get away from associating American food with burgers. But it's great that there were so many variations on that classic. I've never cooked Turkish cuisine. Oh dear, wonder what I'll come up with? This is a wonderful round up! I can't wait to go exploring each entry. 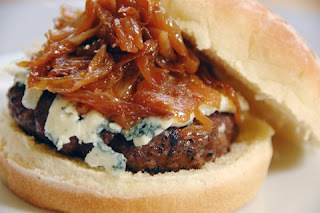 I'm a big fan of the bison burger, as that makes great use of the local game! But, everything looks gorgeous. Can't wait for Turkey. SO much great food there... will have to keep this in mind. Wonder if I can think of a dish to contribute! When you named Turkey I totally had a brain fart for a split second and thought: why are they naming an ingredient?! Duh. 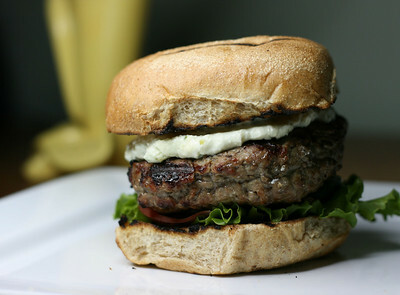 You can't be too bad being from Vancouver....neat blog....the Bison Burger would be right up my alley. It is something I haven't barbecued yet, but have eaten out. Best to you! What a great roundup!! Everything looks delicious! Thanks so much for your efforts in making this event possible. It's a great round-up. Yes, yes, enter something for the Turkey round-up! Haha... I guess we were very focused on the COUNTRY that we didn't even think of the bird! Haha... People from Oregon aren't half-bad themselves. ;) Thanks for the visit!